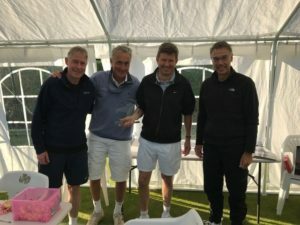 Cromer Tennis Club recently hosted a corporate tennis event for Norfolk Tennis. 8 teams each consisting of 4 players enjoyed a sunny, although rather chilly afternoon on the beautiful grass courts. Teams were made up of local business people and senior Norfolk players. Delicious cakes and tea followed by an evening bar-b-que were provided by the club. The event was won by the ‘Monday Nighters’, a team made up from a group of eight players that have played together for many years! The event raised in excess of £2000 towards the Norfolk Tennis Schools project. Stuart Silvester, Norfolk Tennis Schools Co-ordinator said ‘We are extremely grateful to participants and also the sponsors, Norfolk Homes, Icarus Hines the butcher and Barclays Bank for supporting this event. Cromer Tennis Club were also generous with their time and contributions in making the afternoon such a success. The money will allow us to expand the thriving schools programme in to new areas of the County’.